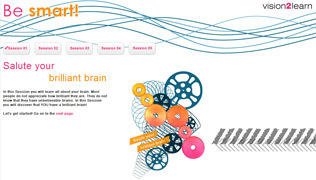 Be Smart is a ‘Learning to Learn’ resource and is part of our suite of ‘performance boosters’. These are resources designed to help your learners explore their considerable capacity to learn and to help your school implement ‘Learning to Learn’ strategies in practical, hands-on ways. Be Smart aims to show each pupil that they have huge potential and ability to learn. In this short online programme students will work through 5 Sessions that will highlight their limitless capacity to learn and ways that they can improve their learning even further. How simple daily actions can improve their ability to learn. During this short programme, learners will work through 5 Sessions. Their brain has unlimited potential. They have the potential to learn much more. The gremlins are not real and they need to challenge them. Laying out a step-by-step approach that shows them how to keep going when things appear difficult. All current learners will find a ‘Learning to Learn’ tab in the navigation bar of their My Study area – Be Smart can be found here.